Family road trips are an American tradition, like theme parks and apple pie. The U.S. is so vast and has such a variety of places to go and things to do that you can create memories literally anywhere on a road tip. Think back to road trips from your childhood, or even as an adult. What about your trip made it so memorable? Maybe it was the family and friends you were with, the destination or the journey. Well, your kids will have great memories too. 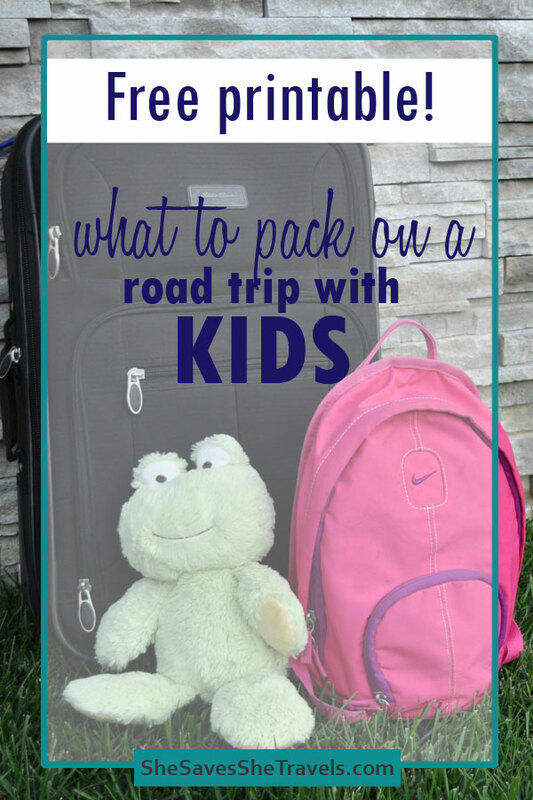 Here are the most important road trip essentials to ensure you and your kids will have a smooth trip. 1. Choosing a great route. This takes preparation but you’ll want to make sure that you choose a route that includes fun stops along the way. A lot of this depends on where you’re located and how much time you have for your road trip. If you’re looking for inspiration for U.S. road trips, check out these 11 Epic Cross-Country Road Trips. 2. Have a plan, but be flexible. What’s your end goal? 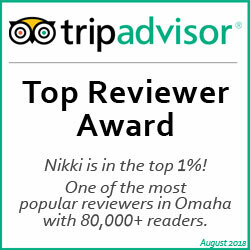 What are the must-have’s on your list of things to do and see, and what are your fill-in activities? You may end up with a stiff back, your kids might be crabby or you might just run across an unexpected adventure. 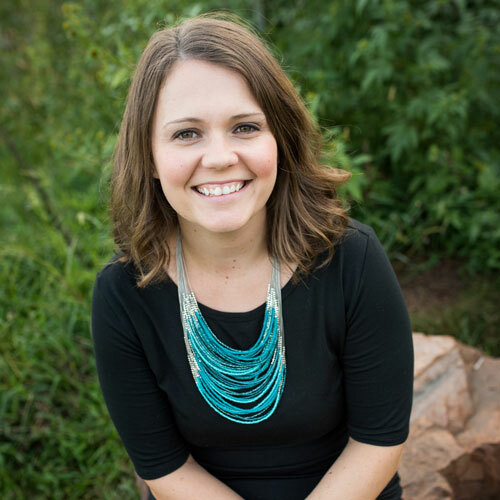 Be sure to be flexible in your plans to account for surprises – the good ones and the bad ones! 3. Pack the right stuff. Be prepared and make a list ahead of time. If you forget something, at some point you’ll likely drive past a town with a Target or Walgreens. But it’s definitely more convenient to just pack it before you leave. While I spent years packing the wrong things, or maybe not enough of the right things, I can say I truly have this down to a science now. 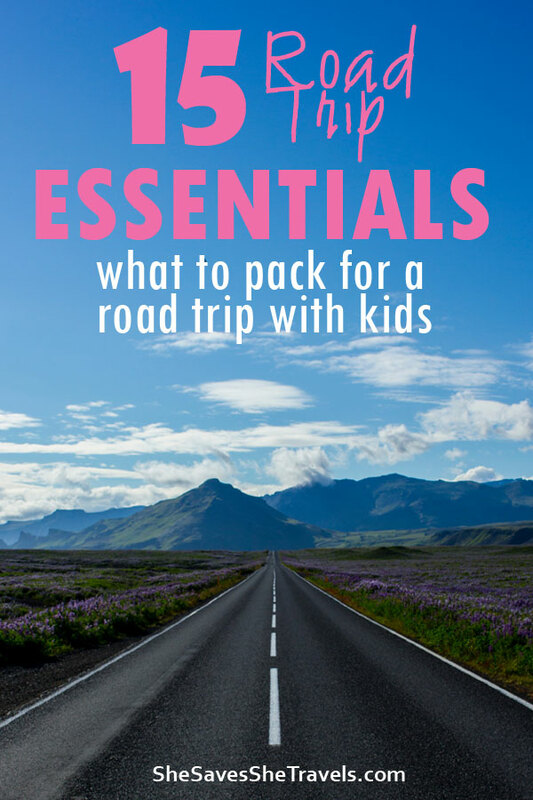 Here are the 15 road trip essentials to pack for a family vacation. Kids activities. 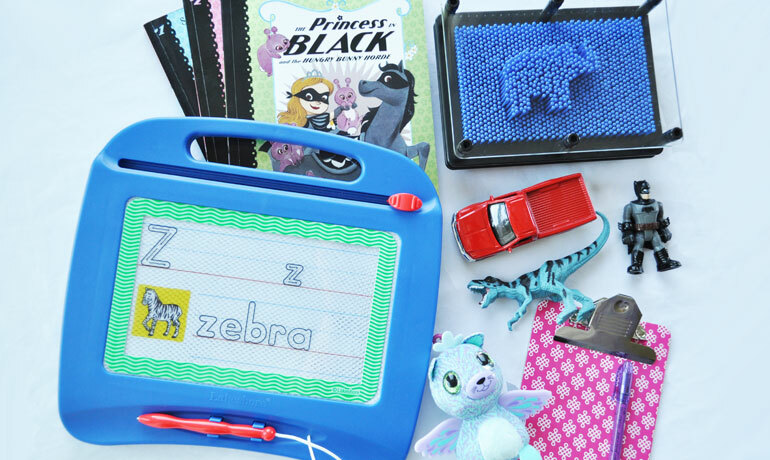 My favorites are coloring tablets, etch-a-sketch, books and a 3-D pin art toy. Consider toys and activities that can be played with for long periods of time. So the key here is to focus on quiet toys that can sit on their laps, without a bunch of pieces moving all over the car. Backpack of their own toys. 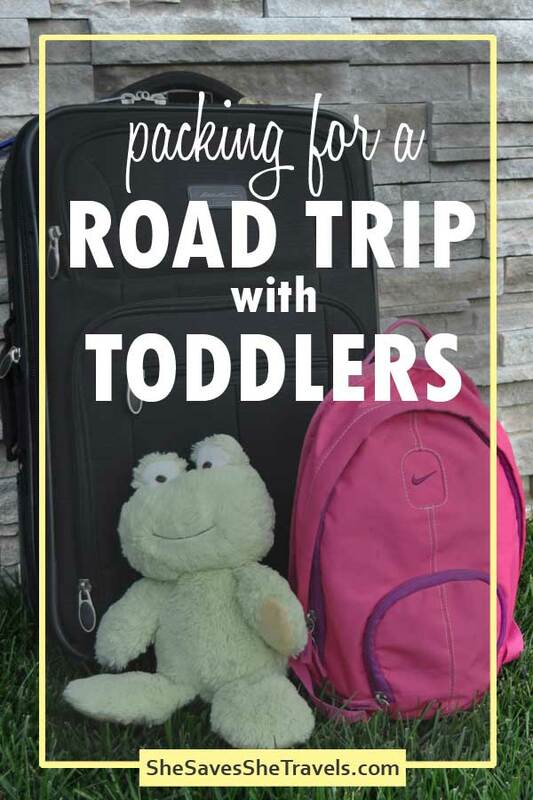 In addition to the activities above, let your kids pack a backpack of books or other toys they want play with in the car. 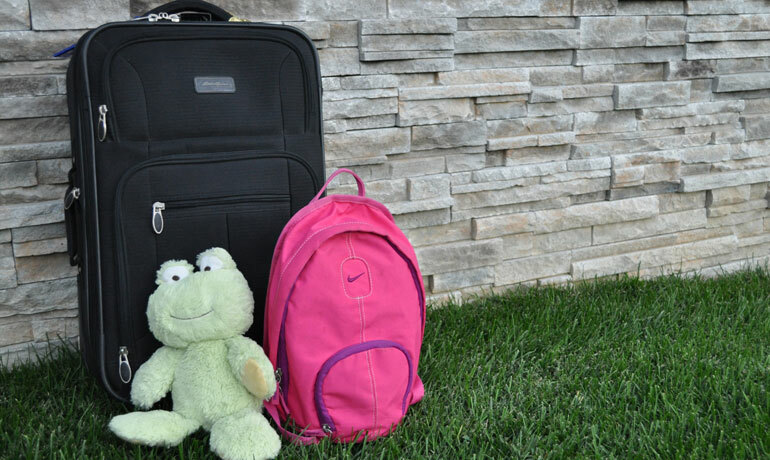 Even though you know what your kids love, having them pick out their own activities somehow makes the backpack of toys a better choice to play with. Tech. When the activities above get boring, bring out some technology to keep them occupied. A tablet like a Fire or leap frog loaded with things to do can help you keep your sanity. Make sure to pack the headphones, too so you’re not listening to Daniel Tiger songs over and over. This is your vacation, too! Snacks. Start with the healthy snacks, because no kid wants to eat string cheese after skittles. Think of foods that are easy to transport and with little mess. I like to pack grapes, pretzels, granola bars and trail mix. The key here is to get individually portioned snacks (or to save money split them up at home). Mini cooler. This is where you’ll put extra drinks and snacks that should be kept cold. Reusable water bottles for everyone. You can keep water handy in the car for you and the kids, not to mention water bottles can be refilled almost anywhere, for free! Napkins or wet wipes. You’ll need them for the snacks above. And ALWAYS pack more than you need. Make sure you grab a bag for trash to go into, too. Charging cables for gadgets. You’ll want to be able to charge your phone, any tablets or other devices that you’re using during the ride. Remember the kids’ tablet chargers too. Car USB charger. In some instances your vehicle will have a fast charging port built in, but if not, grab a car USB charger that plugs into the cigarette lighter port in the car. This will give you extra charging power when something runs out. Travel apps. Load up your device before you go with the top apps for road tripping. Layers! Especially if you’re driving through an area with variable temperatures. Each person in the car should be comfortable, so plan to add layers or blankets. One trip we went from flat lands to mountain climate within a few hours and the temps went from the 90’s to the 40’s and we needed jackets. So just plan ahead. Your patience. This might be the biggest thing to bring with you! Road trips provide memories that last a lifetime, but can be highly stressful, too. When it’s frustrating or agitating, take a deep breath and just remember why you’re on the road trip. First aid kit. I heard a traumatic story a few years back about how a first aid kit helped to save someone on the road. I’m fuzzy on the details, but I know it was moving enough to buy a first aide kit for each of our vehicles. Get one that includes the basics for injuries. I bought this one and have actually used it! Emergency items. Think about the worse case scenario and what you might need. So if you’re traveling in winter, throw a collapsible shovel in the trunk along with an extra couple of blankets. If you’re traveling in the summer, grab extra bottles of water and stash them in case you’re stranded. 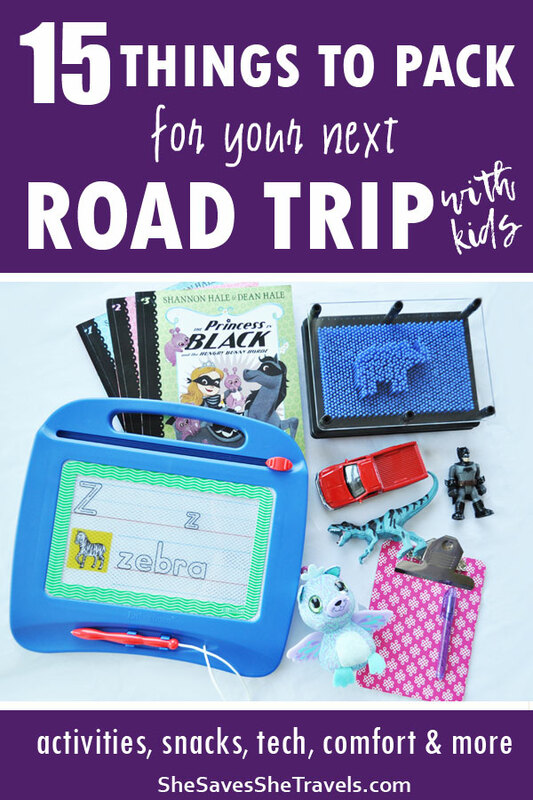 You can expect your vacation will go perfectly without issues, but it’s sure nice to have these road trip essentials if it doesn’t. I usually put the larger, overnight stuff in the car first. Then the lighter items go on top of that, and anything that’s likely to be needed when you stop for gas or attractions. And be sure to use all the room in the vehicle to your advantage! The items above can go at the kids’ feet or on empty seats. Well friend, I hope you enjoy your road trip and that it’s everything you expect and hope it could be. 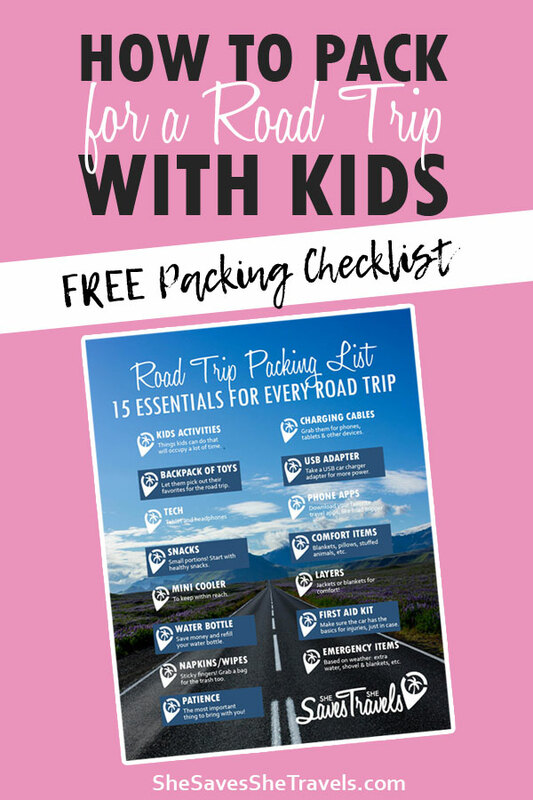 Create your road trip essentials packing list early, and know that your list won’t be perfect the first time. But you’re creating memories with your family and that’s what is most important. Alright I want to hear from you! What’s the best road trip you’d ever been on? Drop it in the comments below!